What happens to the feed after it’s been, well, fed? In America—the land of CAFOs, or Concentrated Animal Feeding Operations, the bane of green and animal activists—livestock produces around 900 million tons of waste every year. That’s 3 tons of manure per American, the equivalent of 2 Toyota Priuses. The logic would be to turn this waste into fertilizer. The antibiotics, pesticides, and chemical fertilizers used in producing the grain and the meat that together produced the waste is so toxic, however, that farmers don’t want it. Thus, nearby every CAFO is a lagoon of toxic waste, a biological experiment producing deformed frogs and plant life, and contributing to air, water, and ground pollution. Should every American be held accountable for said tonnage of waste? They kind of are, what with 34% of adults aged 20 and over being obese, and another 34% being overweight but not obese. Insurance premiums are going up nationwide to pay for all the obesity and heart disease-related surgeries. The earth isn’t getting any slack either, though. All that cow-burped methane has to go somewhere. Oh, right—it hurts the ozone and is raising our sea levels. Still, dumping 3 tons of manure on every American’s doorstep probably wouldn’t end well. The Daily Green has a more realistic solution: lower our meat intake. The still easier, less drastic route suggested by the Environmental Defense: replace one meaty meal a week with vegetables and grains. The CO2 savings would equate the removal of half a million vehicles off the American road system—no small feat. “We might all live a little longer, too,” The Daily Green adds. Alexis Bonari is a freelance writer and amateur musician. Lately she’s been researching college scholarships for women, wishing she knew more about this back when she was a student herself incurring a sizable student loan debt. To keep her sanity she enjoys practicing martial arts and playing PlayStation 3. On the other hand… if all Americans just stuff themselves daily with meat, then there will be fewer heads of cattle emitting this horrible CO2!!! Fewer loads of feed will be trucked in to feed the thinned herds. Win-Win! 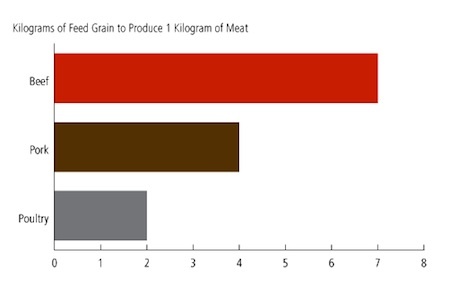 If we eat less meat, then the animals will live years longer, thus consuming tons of feed and emitting the dreaded CO2! BTW: Don’t plants breathe CO2? Don’t the rain forests thrive on it? Don’t the oceans absorb vast amounts? This worry over cow farting is hilarious!!! Hey Gak – Thanks for the brilliantly informed comment. Genius! You oughta do yourself proud and go swallow a Big Mac. Or two. They’re good for you! One of my favourite points. It’s amazing the difference we could make by simply reducing our red meat intake. Hi Moth – thanks for the comment. I agree. It’s a small change that could have great benefits on both environmental sustainability and human health. BTW – I like your blog. I’ll add it to my blogroll.